Nice app, but this Standard version only (what no on developer’s website), and I cannot add object (text, overlay image). Add on object pack have plus price, but no professional upgrade price. Under wheater only rain or snow, no any (random) sunshine, wind etc. Beautiful, if you have a great wallpaper/picture, but as screensaver is not recommended, because many items is static if no use weather or objects (this in professional version only). 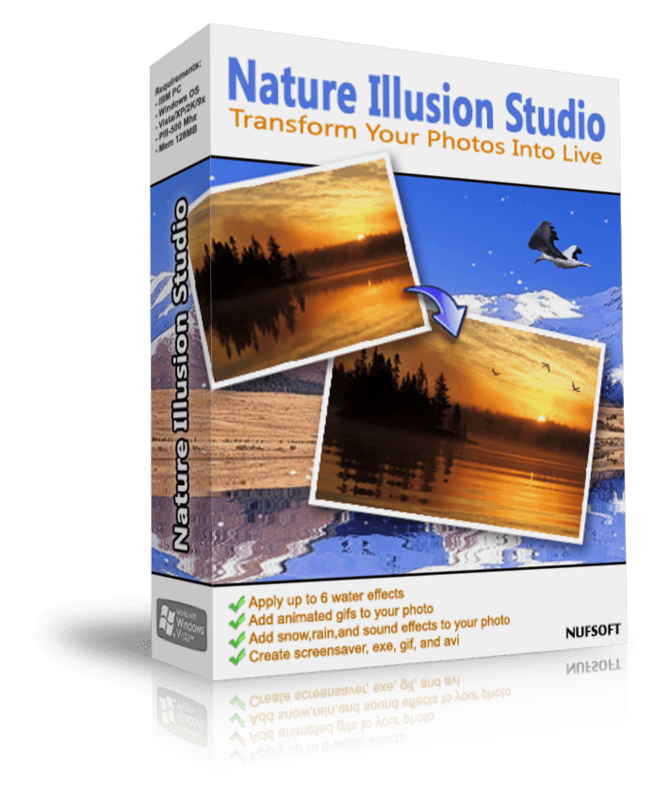 Nature Illusion Studio is an editing application, designed to help users edit their photos and make them look lively using different tools. It helps you transform your vacation photos at the beach, waterfall, lake, and other places into living photos. You can easily edit pictures and add various effects, as well as create screensavers, executable, videos and animated images out of the projects. The installer size is ~5MB and the installation process is simple and straightforward, taking no time at all to complete. After launching the application for the first time, it can be easily activated using the license key. Once done, it is ready to use. At startup, you can choose to open a new project, open an old one, open help page, open samples, or open your recently opened projects. The UI of the application is clean and has modern and minimal design. At the top is the menu bar with usual drop down menus, followed by a toolbar with important options and features. The section to the left contains water mask, tools, effects, presets, and navigator. Res of the area is for preview. There are different effects like water, weather, objects, and sounds. You can load different water presets, adjust settings, add image objects, edit them, add sounds, add texts, and even add weather effects. The navigator lets you zoom in/out on the image and choose the section of the image that you want to view. There’s and Undo and Redo button on the top, along with other buttons to import project as Screensaver, GIF, Video, and EXE. There’s a preview button on top that lets you preview the applied effects to your image. The theme of the UI can be changed from the top right. – Simple and easy to use UI. – Add animated gifs, images, text and customize their movement and appearance. – Add snow and rain effects, and adjust settings like particle counts, transparency, rain drops length, snowflakes size, and wind direction. – Add sounds up to 8 channels and customize them. – Create screensavers and exe with your projects. – Create GIFs and videos, and adjust resolution, frame rate, length, and more. – Add up to 6 different types of water effects in a single image, and use many different presets. – Theme of the UI can be changed. – Comes with different samples to get you started. – Most effects look unreal, and aren’t of much use. – Fewer editing tools compared to other editing applications. 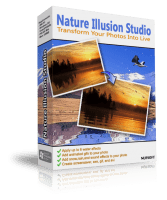 Nature Illusion Studio is a simple yet powerful editing application, that allows you to add lively effects to your photos and turn them into screensavers, GIFs, videos, and exe. The effects are not realistic, but they can still bring a nice touch to photos. The application runs smoothly, without any lag or errors. It is definitely worth trying. registration key was also quickly emailed.